One of the most rewarding aspects of volunteering at the shelter is seeing the transformation of the pets in our care, especially after they are adopted by loving families. Bella the Saint Bernard's transformation has to be one of the most dramatic. Bella was extremely neglected and was only 48 lbs. 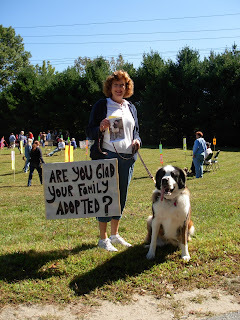 when she came to us, even though she was a 1.5 year old Saint Bernard. She attended our event on Saturday and couldn't be more gorgeous or well cared for now, thanks to her wonderful owners. The before and after photos speak for themselves.